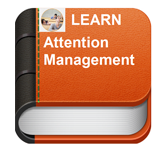 What is Attention Management Tutorial? As per the survey, small workforce is considered better than a large distracted workforce. It was known as less effective incase if your teammates doesn’t pay much attention. An inattentive employee always makes silly mistakes, and remarked as less productive. This is called as Attention Management. This tutorial is useful for employees who have trouble focusing on their jobs, or people who are unable to manage their times, either because of juggling multiple assignments or being in a tough job. To learn this tutorial,one must have a calm mindset and be open to exploring the suggestions mentioned here.